What product should we purchase to eliminate a lingering odor that has persisted for 18 months following the dry cleaning of linen/wool mix curtains (4 sets) all in the same room? We believe the smell may be caused by a chemical reaction caused by a preservative on/added to the material at the production stage. Any and all assistance greatly appreciated. VAPORSORB™ Vapor Absorbent Pouches will help you to remove the chemical odor in your clothing. I would recommend storing the pouches with the affected dry cleaned items in a bag or container for about a week. Thereafter, inspect the items. The pouches will draw out and reduce the offensive chemical vapors. If you still have some chemical smell left, rejuvenate the pouch by heating in a microwave for 4 minutes or placing in direct sunlight for a day and store with the clothes again. Repeat, if necessary, until you have eliminated all the offensive odors. Is There an Odoreze™ Clothing Odour Eliminator Distributor in Italy? Searching the net for an odour neutralizing additive to use in a washing machine to get clothing smell out, I came to discover your Odoreze™ Clothing Odour Control Products. Would you be able to tell me who distributes this in Italy and under which brand name or alternatively send me a free sample for a trial? I would recommend using ODOREZE™ Natural Laundry Smell Additive for your application. Simply add to your regular laundry detergent while doing your wash to remove the offensive clothing smell. Alternatively, you can soak your smelly clothing in ODOREZE™ overnight and then wash for extra effect. How Do I Rid Leather Smell? I would suggest using SMELLEZE™ Laundry Smell Deodorizer Pouches to eliminate the leather smell. Simply store the pouch with items that have leather smell for a week. Thereafter, inspect the items. If you still have some leather odor left, just rejuvenate the pouch by heating in a microwave for 3 minutes or placing in direct sunlight for a day and store with the smelly items again. Repeat, if necessary, until you have eliminated all the offensive leather odors. I have two beautiful leather jackets hanging in my closet that have never been worn because these jackets are treated with chemicals and they are impossible to wear with that smell coming off them. I have aired them outside at night, in the daytime for a couple of years with some improvement, but the chemical still emits off the jackets. Do you have any suggestions? 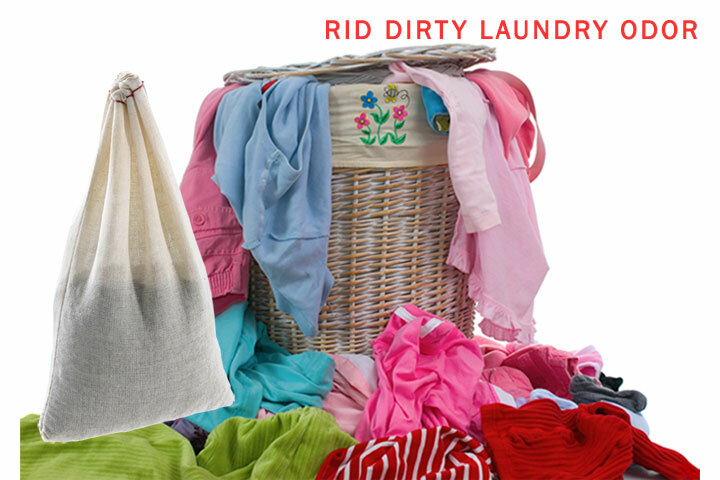 To get the chemical odor out of clothing and other items that are not washable, you may place them in a garbage bag or container, insert a Smelleze® Reusable Laundry Smell Deodorizer Pouch and/or sprinkle Smelleze® Reusable General Purpose Deodorize Powder on them and store for a few days to allow the chemicals to be drawn out. Repeat, if necessary, until the odors are gone.